The Tri for a Cure is Maine Cancer Foundation’s signature fundraising event, having raised more than $12 million to date. 100% of funds raised stay in Maine to support cancer prevention, screening, and access to care programs. Each participant is required to raise $500 to support the cause. The money you help us raise will make a difference in the lives of your neighbors and communities around Maine. The fundraising deadline is 5pm on Thursday, July 11. Your credit card will be charged for any remaining balance on July 12. Aim high! You can set a goal above the $500 minimum but will only be charged if you don’t hit $500. We have lots of fundraising prizes to reward you along the way! Help! How do I fundraise? Don't panic! Start off by making a small donation to yourself. Not only will it "get you off the starting line," it's a lot easier to ask friends and family for a donation when you can say, "Can you join me? I donated $20!" 2. Make it all about them! Remind them that we ALL know someone affected by cancer – each of us has a relative, a friend, a neighbor, or a co-worker who is battling the disease right now. Let them know where the dollars go: 100% of funds are invested in Maine, to provide grants for cancer prevention, early detection and screening, and access to care. Explain to your friends and family how the work of Maine Cancer Foundation impacts them. Reinforce that every dollar donated helps – we can all make a difference. No donation is too small, and every dollar counts. Here's an awesome fact to share with the people you ask for a donation: 100% of their gift will go directly to Maine Cancer Foundation’s grant programs. The event costs have been covered by registration fees and sponsor contributions! 3. Personalize your fundraising page. Tell a story! Each athlete has a unique fundraising page on the event website that accepts credit card donations and handles all the processing. You can personalize your page and share it with anyone you like. Customized pages get 20% more donations on average than pages with the generic text. Set a personal fundraising goal. Then double it. That will be the number on your fundraising page. If your goal is too low, people stop giving. If your goal is high, they will help you meet it. Everyone loves the person who is trying hard for a cure. 5. Email everyone in your address book, even those you don’t expect to give. You'll be surprised at who responds. Also make sure to email your request more than once. Send emails out to everyone in your contact list and let them know your fundraising goal and give them a link to your fundraising page. A picture is worth a thousand words! Check back frequently and send follow up emails. Let people know how your training is progressing, so your follow up emails will be a welcome note while reminding people who forgot to give. Remember: Email generates the lion’s share of all donations. We recommend asking once and sending a reminder about a week later. You will be amazed at how many people will be excited to donate to your fundraising effort, not just close friends. Consider using your computer camera or smart phone to record a one-minute video of yourself. Upload your video to YouTube, to your Facebook page, or to your Instagram account. Explain what your goal is and how people can help. Link it back to your fundraising page and share it far and wide. Not everyone uses Facebook, but if you do, it can really help. Do you tweet or Instagram, or use other social media? Make sure all your friends on social media know about your race and your fundraising goal. You can add a link directly to your fundraising page. The more you spread the word, the more success you’ll have. 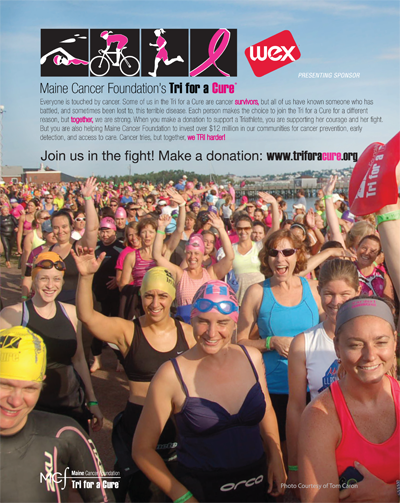 Post updates to your own page and share the word with the Maine Cancer Foundation and the Tri for a Cure Facebook pages. Note: Facebook is responsible for 90% of social donations. Most Facebook users are on in the evening, so that's the best time to post. Many employers are willing to offer matching gifts for charitable events. Does your business have a matching gifts program? It never hurts to ask. Send your employer to the Tri for a Cure website – who knows? They might even want to become a sponsor! 10. Do what you do best, and be creative! We all have special skills. Tap into your best talents to support your fundraising. That could mean: throwing a benefit dinner or party, having a bake sale or a raffle; or hosting an event at your local watering hole or eatery. Many local restaurants or retailers will work with participants to donate a portion of sales for a day or evening towards your fundraising. We can provide carry letters for this purpose. Bottle drives, talent shows, you name it! Think of something fun you enjoy doing and invite your friends and family to join you, and make your fundraising goal a team effort! Remember – you are not asking for money for yourself – you are fundraising for Maine Cancer Foundation, and we are changing the story of cancer in Maine. Last year the Tri for a Cure raised over $2 million to support vital cancer prevention, screening and patient support programs. Incredible! We couldn't do it without you! We know you work hard to meet your fundraising goals, so we have some fun prizes to say thank you. Don't worry: the average triathlete raised over $700 last year. It's easier than you think! Please note that the fundraising deadline for incentive prizes is 5:00 pm on Thursday, July 11, 2019. Donations are accepted after this date, but will not count towards incentive prizes. 2019 Incentive Prizes will be announced soon! Need a boost to your fundraising? You're welcome to use the logo to help spread the word! 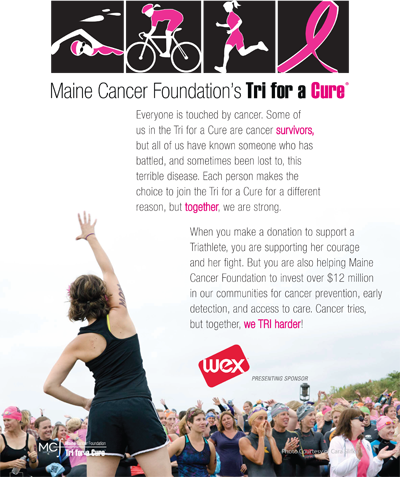 The Tri for a Cure logo should only be used for donation-based fundraisers or things like tickets to a party. Percent of sales are allowed, provided you clearly state the percentage to be donated to Tri for a Cure. Let the pictures tell your story, and help in your fundraising efforts. 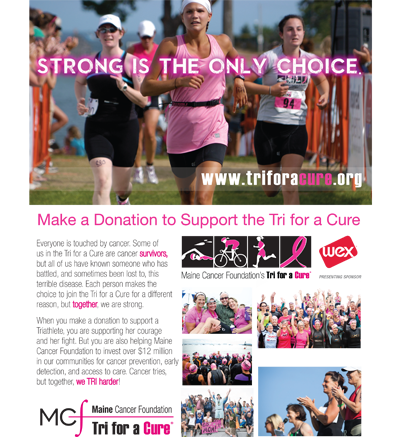 Use these colorful 8.5" x 11" fliers at your office, or at your fundraising events to help tell the story of the Tri for a Cure, and attract more donations. Just click the one you like, download it, and print! 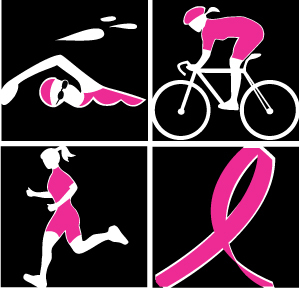 The Maine Cancer Foundation Tri for a Cure is a fundraising event, and all funds raised will be used to support the mission of Maine Cancer Foundation to reduce incidence and mortality rates here in Maine. By registering for the event, participants are committing to raising a minimum of $500. Because we have a limited number of slots, there are no exceptions to this rule. The commitment will be upheld even in the event that you are unable to participate in the event for any reason. This includes (but is not limited to), injury, illness, unexpected pregnancy, or relocation. The commitment applies to all participants, including sponsors’ slots, and is the same for both individuals and relay team members. Following the registration drawing in February, participants have until May 1 to withdraw without penalty. If a participant withdraws on or before this date they will not be required to fulfill the fundraising minimum. Any participants withdrawing after this time will still be responsible for raising or paying the $500 minimum. Bibs are not eligible to be transferred at any time or deferred to a future year. This applies both to PIN numbers secured in the lottery and completed registrations. If you are unable to participate for any reason, you are still encouraged to fundraise. Those who raise $1,500 or more will be given a guaranteed entry to the following year. Each member of a relay team is required to fundraise a minimum of $500 individually. If one team member raises over $500, donations cannot be moved to another team member without permission from the donor. The May 1 withdrawal deadline applies to all members of a relay. If a team member withdraws, an existing teammate can absorb the leg of the teammate that has had to withdraw. Team captains are encouraged to secure team members as early as possible, and no later than May 1.